Everyone knows that when you usually leave a kids party you're waved out the door with a party bag in toe. Kids love them but they're normally full of absolute trash that breaks or gets thrown in the bin two seconds later. There's now a brilliant alternative on the market from My Pocket Money Toy so you no longer need to live in fear of dull plastic rubbish. No, what you need is the fabulous Party Boxes! 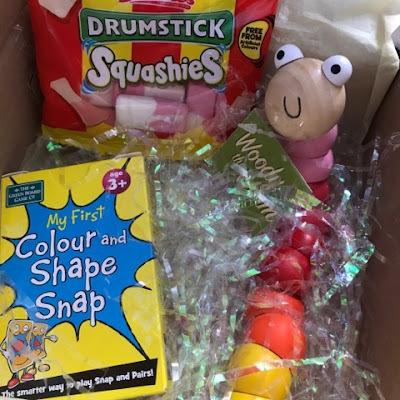 If you are looking for something a little different for your child’s birthday this year then the mini party boxes are for you. The mini party box is an ideal party favour and can be tailored to any budget. All contents sourced are good quality items and can be matched to your party theme. Just think rainbows and unicorns, dinosaurs, football, teddy bears picnic, the jungle, under the sea. The possibilities are endless. 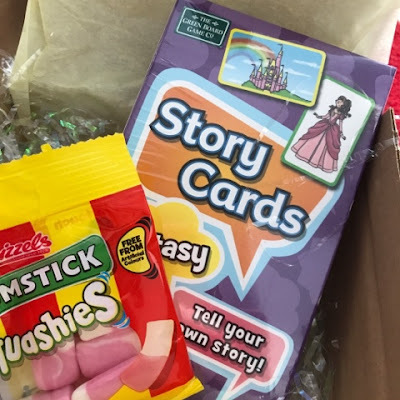 Every child will be delighted with their mini box, and no more party bags going straight in the bin! Prices range from as little as £4 per box and can be completely tailored for your needs. The lovely My Pocket Money Toy can also create a personalised ‘Ooh Katie Q’ birthday colouring sheet to be included in your boxes. It really is something different. 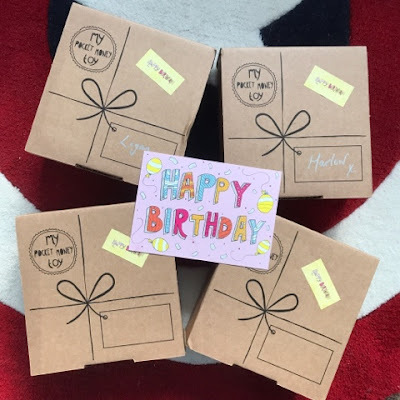 Since Harlow's birthday was last week we were sent a few boxes to take a peak at and to give our thoughts. First impressions are really good. The box itself is good strong quality cardboard with a lovely ribbon design on the front. There's a name tag rectangle on the top so perfect for personalising boxes for each child at the party and writing their name so they get the correct box. 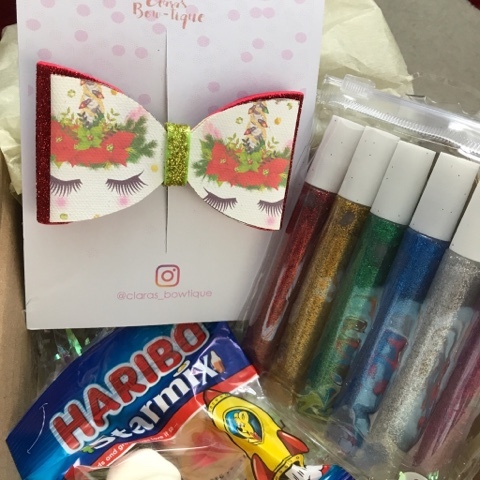 The box is simple and easy to open, no stress here, and the items inside are lovingly wrapped in tissue paper (which can be personalised to a colour of your choice) with shredded pearlescent confetti on the bottom. Inside each box (we received 4) there were a selection of lovely little gifts. From glitter pens, sweeties and story cards to dinosaur modelling clay and beautiful hair bows. I was really very impressed with the selection of items sent and that they were such good quality for being party favours. I always remember party favours as being tatty but these are superb. My personal favourite was the gorgeous unicorn hair bow from Claras Bowtique. It's stunning and also nice to see that My Pocket Money Toy use small independent businesses. I really would highly recommend these mini party boxes. They're so cost effective starting at £4 and save you the hassle of running around buying favours and organising them all into bags. I love that they can be personalised the way you want them and that themes can be done too. I'm thinking Minecraft theme for Logan when he has his next party as how awesome would that be! 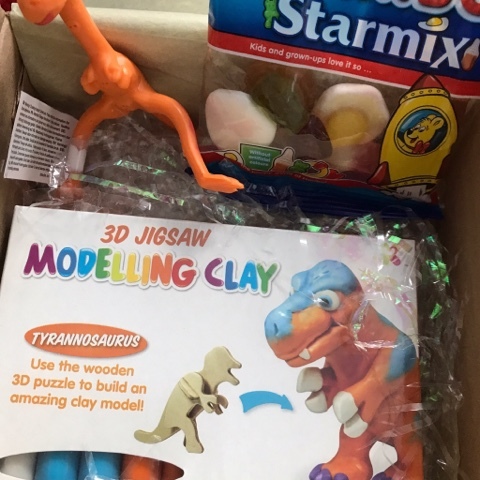 Also don't forget that My Pocket Money Toy do subscription boxes which also make excellent birthday presents so do check out their website for more details and simply email info@mypocketmoneytoy.com to discuss your party needs. My Pocket Money Toy are more than happy to help in anyway they can. I was sent 4 boxes in return for an honest review. All opinions are my own. 5 comments on "Review: My Pocket Money Toy Party Boxes"
What a fab idea. I hate party bags, so much plastic rubbish that doesn’t even last the car journey home! These look about 10000 times better than the party bags we'd get as kids. And they probably cost the same too! !